Pergolas allow you to add both function and fashion to an outdoor space. 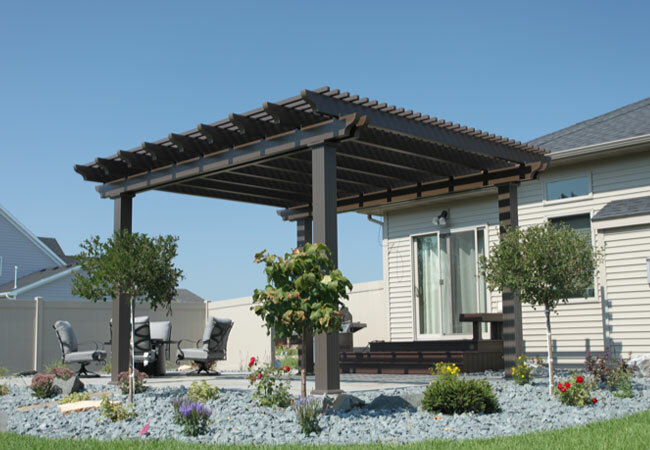 While providing shade from the heat of the sun, a pergola extends the time you spend outdoors. Additionally, they add an architectural detail and can visually frame living spaces, dining spaces, or any outdoor area. Deckmasters offers low maintenance aluminum pergolas in four colors with four end cuts. In addition, multiple column profiles and heights are available. Furthermore, customize rafter and lattice spacings for an individual look. 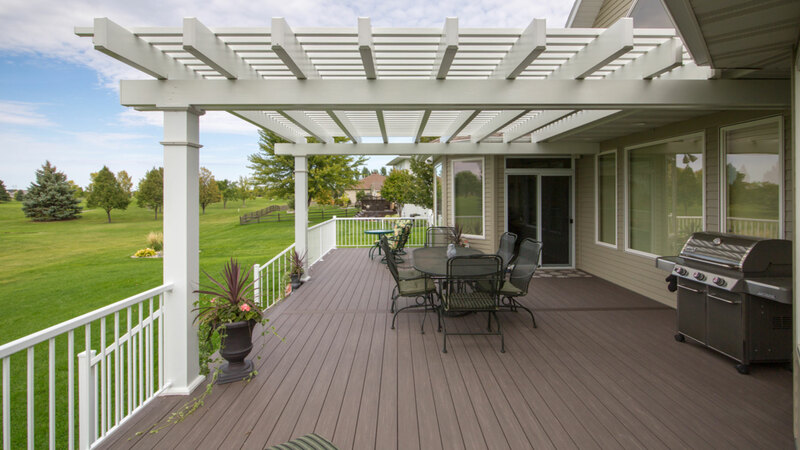 Great Plains Pergolas is the results of many of installing other aluminum, fiberglass and vinyl pergolas that underperformed. Deckmasters set out to innovate better component design and installation process for Aluminum Pergolas. Each pergola is designed with a structural double beam(s). Additionally, all beams and rafters are a full 3” x 8” profile. For a clean look, hidden brackets/fasteners are utilized where possible. Full 2” x 2” lattice tubes provide ample shade. Most importantly, we engineered the best anchoring system, designed with Midwest winds in mind. 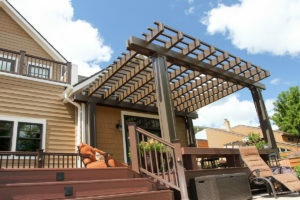 Come visit our recently remodeled Fargo showroom and see the various pergola styles and colors. 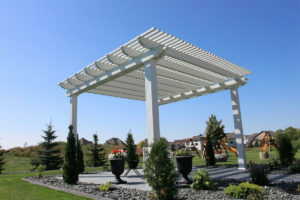 Our team can help you determine a perfect pergola design. There are many ways to customize your kit. 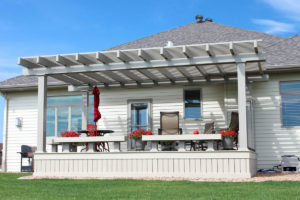 First, choose the pergola’s color, Pewter, Chocolate, Adobe, or White. Second, choose an end cut, Corbel, Scallop, Bevel, or Miter. Third, customize your kit by selecting a column profile, Fluted, Paneled, or Smooth. Finally, determine spacings of rafters & lattice. 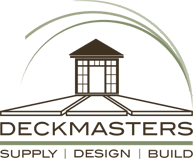 We have decades of experience, so you can rest assured that our designers will help in providing the best design for your custom pergola. Deckmasters louvered pergolas allow you to choose sun or shade. 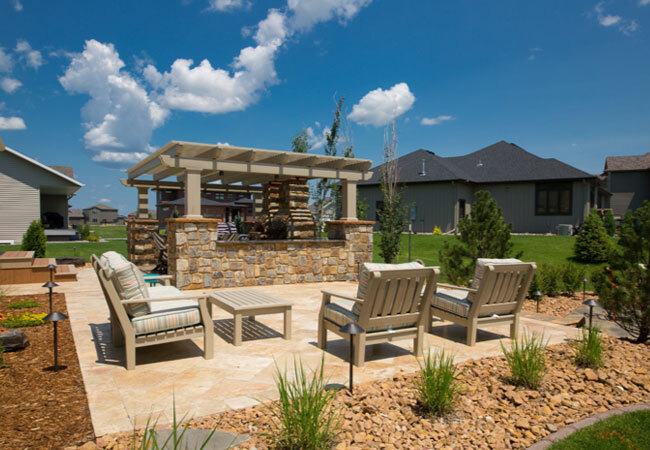 With a louvered pergola you can spend more time outside, even when the weather isn’t cooperating. 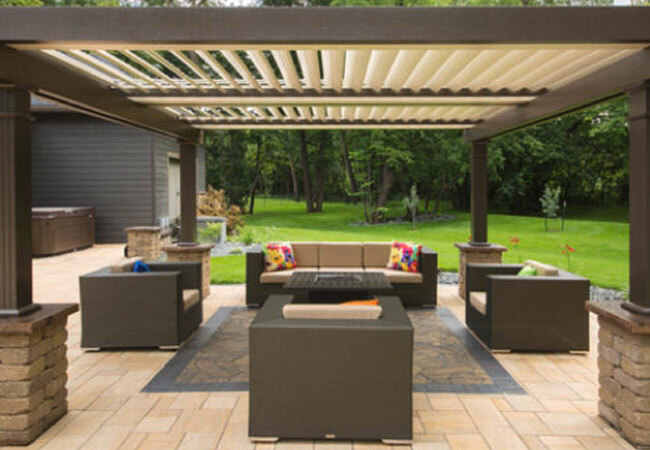 First, with a motorized louvered pergola, you are able to control mother nature’s effect on your outdoor getaway. Secondly, it allows you to let more light in or out. To clarify, louvers can be completely open or closed to filter the sun. Finally, when completely closed, you can stay cooled, shaded and protected from the elements.